In a previous article entitled, “US Natural Gas Export: A Sensible Move?” dated September 2014, I wrote about the nonsense surrounding the US gas export meme and debunked the frack gas miracle. Many arguments used for my case, which was that the gas boom was not a long lasting one and that the US should not export gas, hold true for the shale and tight oil industry as well. This updated and expanded article will describe how the fracked wells are not like the “old school” wells that we knew, and will add three more arguments about the frack oil industry in the US. 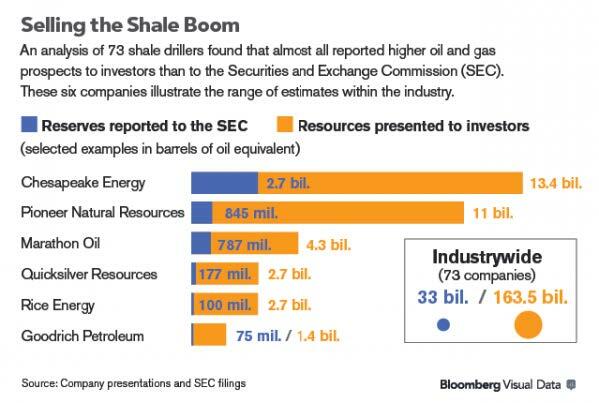 First, the figures – the ones in the graph “Selling the Shale Boom” – reported by the US Securities and Exchange Commission, the SEC, and those from investors are very different; the investors’ are massively inflated. Second, the break-even cost of nonplateau oil assets deteriorated dramatically in the US, and if WTI Oil drops under $75/barrel the whole industry will go belly up. The third one is what I call the BOE, barrel of oil equivalent, deception, in which gas is considered as oil in mmbtu terms without being the same in dollar terms. Before concluding, I will explore how the Federal Reserve’s accommodating monetary policy has created this massive bubble. 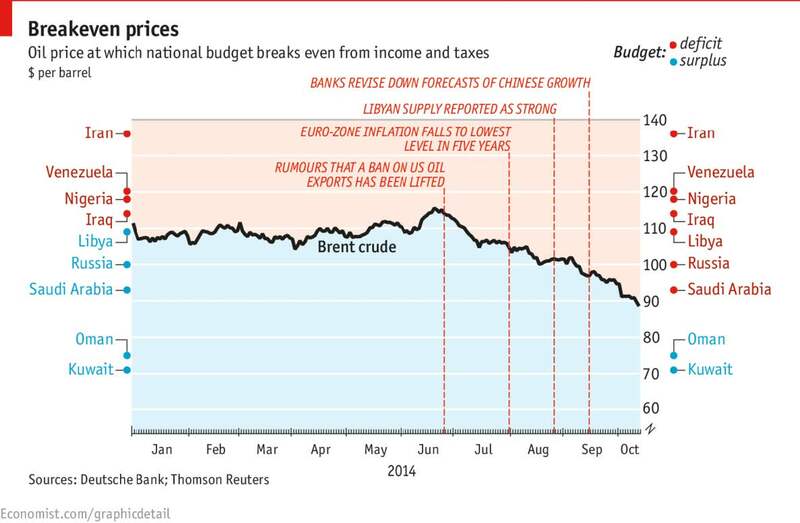 Breakeven prices (for state budget) for major oil exporters. Economist 2014. This updated and expanded article will describe how the fracked wells are not like the “old school” wells that we knew, and will add three more arguments about the frack oil industry in the US. The sharp increase in production brought on by fracking has certainly been remarkable. However, even in their best case scenario, high and climbing oil prices, US shale producers will be pushed to maintain the high level of output they have achieved in recent years. This is because a shale well has a limited lifespan of around seven or eight years. According to Pete Stark, a geologist and analyst at IHS, the output of shale wells drops faster than conventional ones, falling by 50-80% after the first year, and one well, stated an article on Oilprice.com, in the Bakken fields dropped 69% in its first year. Traditional wells, according to a 2014 article in Bloomberg, take two years to fall by about 55% before flattening out. This forces companies to keep drilling new wells to make up for lost productivity. A conventional oil field produces crude at a level that wanes slowly over the course of decades. Saudi Arabia’s massive Ghawar field (biggest field ever), for example, began production in 1951 and is still pumping out around five million barrels a day. This is a well known fact. 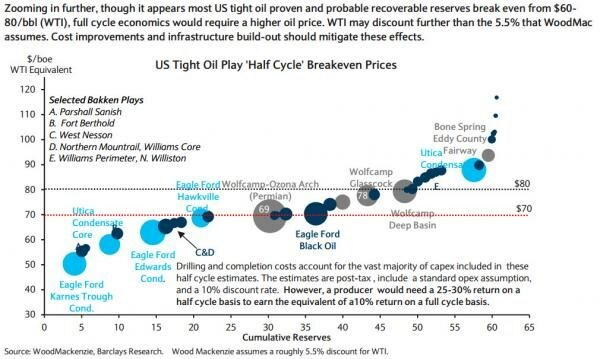 US Tight Oil Play “half cycle’ Breakeven Prices. Wood/Mackenzie, Barclays Research / Zerohedge.com 2014. It is not the purpose of this article to dissect the nuances about reserve, resources etc., let’s just be reminded that a mineral resource is an occurrence of material of intrinsic economic interest in such form, quality, and quantity that there are reasonable prospects for eventual economic extraction and a mineral reserve is a resource known to be economically feasible for extraction. What is important to understand is that reserves are more “real,” resources are just potential. It is mainly a function of price and technology. Discrepancy between reported and presented resources. Bloomberg 2014. As a further example we have the case of “California’s Monterey Shale, which the U.S. Energy Information Agency thought contained 13.7 billion barrels of oil in 2011. Closer examination revealed the formation to be much more broken up underground than previously thought, so much so that only around 600 million barrels may ultimately be recovered with current technology.” This is highlighted in an article in zero-hedge entitled “Fracked Up: Don’t Believe in Miracles”. “That’s a 96% downgrade, and there is no guarantee that other predictions of shale oil riches both in the U.S. and elsewhere won’t have similar outcomes,” the article concludes. 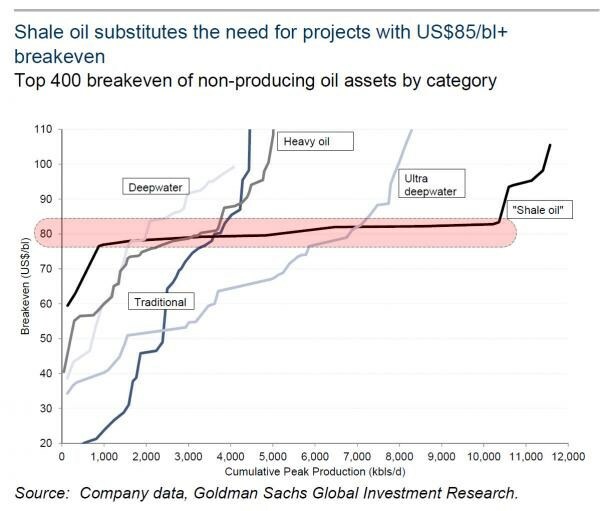 Shale oil substitutes need for projects with $85/bl+ breakeven. Goldman Sachs / Zerohedge.com 2014. What is obvious to me is that if we combine the knowledge derived from these charts and the known fact that at any time the best marginal fields are used first, leaving the less productive and expensive for the future, we (as a civilized society) are on a collision crash course. But how about cost reductions? If the oil price goes down, and the oil industry reduces CapEx “at a time of material expansion of oil service capacity, it could lead to a potential 5-15% cost deflation across oil developments, after a decade of 10% inflation,” according to an article published on zerohedge.com in October 2014 entitled “Why ‘75’ Is The Most Important Number for US Economic Hope.” It is a reasonable scenario. 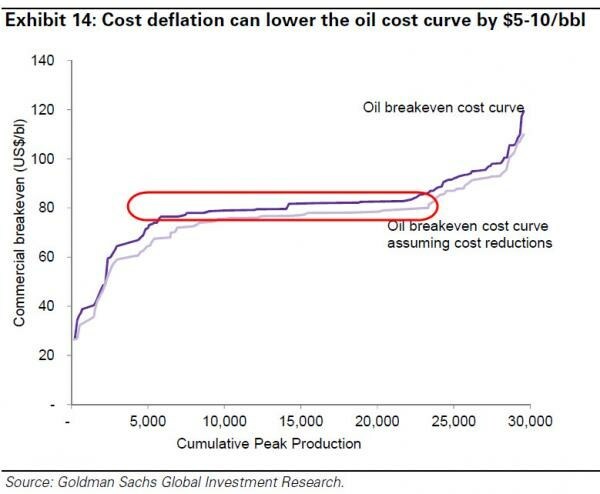 Cost deflation can lower the oil cost curve. Goldman Sachs / Zerohedge.com 2014. Looking at this data, we can assess that the shale oil boom would be severely damaged if the oil price falls and stays under $75/bl. If we look at these numbers from a financial point of view, and incorporate some cost reductions as Goldman Sachs (2014) did in this next chart, it would appear evident that only some fields provide some meaningful return, the others needing a much higher oil price. “Using an oil price of $80 per barrel and a natural gas price of $3.50 per thousand cubic feet we can calculate the value of a BOE of natural gas priced as gas: $20.30. However, a barrel of oil is not worth $20.30, but rather is currently worth more than $75 per barrel. Yet a BOE with 100% gas is worth only $20.30. The barrel of oil is actually worth almost four times more than the supposedly equivalent “barrel” of natural gas. Certain companies purposely use this concept because they want to value their gas reserves at more than seven times their actual value. What it means is that the value of NGL is also going down, reducing even more the overall profitability of the BOE. The impact of the FED’s low rates policy on the oil economy. The oil and gas sector is capital intensive. As discussed in my previous article, the “fracking miracle” may not be all that it is believed to be due to fast production decline rates and massive amounts of leverage. The energy sector is the largest single industry component of the USD DM HY index. Drillers have borrowed huge amounts of capital to acquire leases, drill wells, and install processing equipment and infrastructure. Even as debt piled up, the decline rates of fracked wells forced drillers to drill new wells to make up for the dropping production from old ones (remember, the decline can be as high as 70% after just one year), and to drill even more to show some kind of growth. All this was funded in part by High Yield debt, called junk debt. Wolf Richter wrote in October 2014 in ‘Wolf Street”, a blog about business and finance, that “junk bond issuance has been soaring as the FED repressed interest rates and caused yield-hungry investors to take on more risk” to earn some meaningful return. “Demand for junk debt soared and pushed down yields further….The proportion issued by oil and gas companies jumped from 9.7% at the end of 2007 to 15% now, an all-time record.” An article in Bloomberg explained further: “Shale debt has almost doubled over the last four years while revenue has gained just 5.6%, according to an analysis of 61 shale drillers published in Bloomberg. A dozen of the surveyed companies are spending at least 10% of their sales on interest compared with Exxon Mobil Corp.’s 0.1%.” (Bloomberg 2014c) “Interest expenses are rising,” Virendra Chauhan, an oil analyst with Energy Aspects in London, was quoted as saying in Bloomberg. “The risk for shale producers is that because of the production decline rates, you constantly have elevated capital expenditures.” In a world of falling interest rates, the newcomers have a competitive advantage over the old ones, paying less and less for capital, and having less debt to pay on. 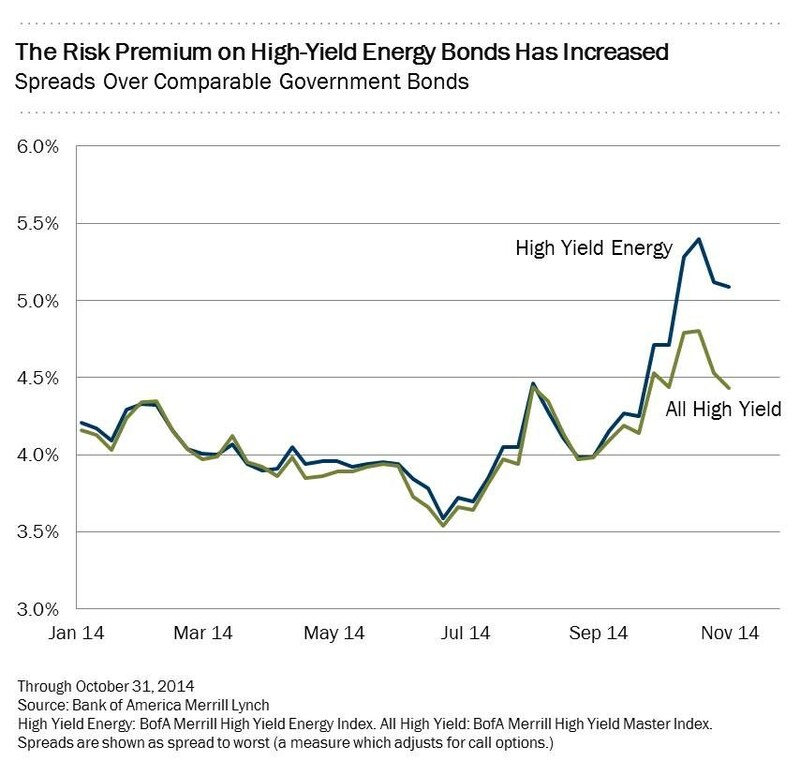 Risk Premium on High-Yield Energy Bonds. Bank of America Merrill Lynch / Forbes 2014. “A 25% drop in oil price so far has pushed D/EV valuations among US energy B/CCC names to a point suggesting 8.5% future default probability, while their bonds are pricing in a 9.5% default probability.” Deutsche Bank’s stress test shows “that a further 20% drop in WTI to $60/bbl is likely to push the whole sector into distress, a scenario where average B/CCC energy name will start trading at 65% D/EV, implying a 30% default rate for the whole segment. A shock of that magnitude could be sufficient to trigger a broader HY market default cycle, if materialized.” (Zerohedge/Deutsche Bank 2014). Clearly the shale O&G revolution is a major misallocation of capital, and this is without accounting for the massive investments in LNG export plants. Low US gas prices have hindered the development of renewable energy sources, directly by making them more uneconomic, and indirectly, giving the impression that the US is sitting on a sea of cheap and infinitely abundant gas. And remember that in during the 2007-8 “subprime” crisis prices of oil wend in the $30s they didn’t stop at $60. We can only imagine what the consequences for the shale oil sector would be if this happens. soon there will be a very vocal, very insolvent, and very domestic shale community”, as is written in zerohedge, “demanding answers from the Obama administration”, as once again “hope” and “change” will have trumped farsighted statesmanship. An article in zerohedge “Houston, We have a Fracking Problem” sums up the situation well: “With oil prices and demand falling at a time when production is strongly rising, the risk of a supply/demand imbalance has significantly increased. This puts the prices and valuations of energy companies, particularly drillers and service suppliers, at risk as well.” The whole ecosystem will be under stress. As the Danish Physicist Niels Bohr once said, “Prediction is very difficult, especially about the future”, so I will not predict a catastrophic end for the shale industry in the next years. However, the survival of the frack industry is a function of high Oil&Gas prices, and nobody knows what these prices will be one month or five years down the road or what the real floor price for the survival of the frack industry as we know it today is. Hitherto we know that the sector didn’t make profits in the last years of relatively elevated prices and minimal regulation. Also during this period it used the best fields available. In the meantime it accumulated enormous debts in an environment with the lowest interest rates in recorded history. Will the frack industry survive a possible less favourable future? It seems we are at Peak Shale right now. The very best of the best wells are being drilled, and they are new and at peak production, interest rates are near zero, they can’t go lower. So shale is in its golden age. It can only go down from today UNLESS oil prices spike again. In that case, even shale could last for decades. It demands a high price, though, to keep going. Fabio Herrero is a student in the ENERPO program at European University at St. Petersburg.